The economic rationale for investing in early childhood programming is gathered from three types of analyses: longitudinal data quantifying the human capital benefi ts and reduced health and social costs for children who attend preschool; economic modelling forecasting the payback from the enhanced labour productivity of working mothers; and studies examining the early childhood sector itself and its multiplier eff ects on economies. Validation of the human capital approach is heavily influenced by U.S. longitudinal studies showing sustained benefits from early interventions for children from disadvantaged homes. Based on these findings, respected economists, such as Nobel Prize winner James Heckman, concluded that scarce public resources would best be used for at-risk communities. Population health promoters countered with data showing that developmental vulnerabilities are not exclusive to children from low-income homes—children with these vulnerabilities exist across the economic spectrum. Targeting resources, they demonstrate, would exclude the majority of children with vulnerabilities, including those residing in middle class and affluent families. Most recently, economists are questioning whether “scarce resources” are even a consideration. Quebec’s early childhood program has been criticized for its costs. However, recent analyses found the province recoups its entire outlay from the additional tax revenue generated by working mothers, while the federal government—that contributes little to the program—enjoys a $717 million annual windfall. The research shows the “just can’t afford to” excuse for denying young children their fair share of society’s resources has no substance. Researchers have followed three U.S. gold medal longitudinal studies on the impact of preschool education on children from disadvantaged backgrounds. The participants were largely African- American children deemed to be at-risk because of low family income, mothers’ age, educational attainment and lone-parent status. The families typically lived in neighbourhoods with persistent poverty and high rates of crime. Children changed schools and housing frequently. Ypsilanti’s Perry Preschool (initiated in 1962), the Abecedarian study in North Carolina (1972) and the Chicago Child-Parent Centers (1967) have tracked their original cohorts for up to four decades. Each study was unique, but all provided a group program emphasizing parent involvement and the development of literacy skills. Child-to-staff ratios were low and educators had university level training in early childhood education. No long-term effect was found on the IQ of the participants, but preschool did help children develop better cognitive habits and improved impulse control. The Chicago and Abecedarian studies included samples of children who attended both preschool and enriched school programming. Others participated only in preschool, or only in enriched schooling. The most consistent and enduring outcomes were from preschool participation. School-aged programming provided added academic and earning advantages, but social behaviours were not appreciably different from the preschool-only groups. 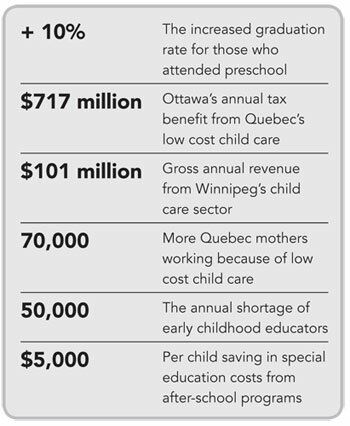 The benefits of preschool were quantified by comparing the original costs of the program per child to their adult behaviour, including employment earnings, taxes paid, social welfare used and criminal justice costs incurred. Preschool’s influence on health costs was not considered in the overall tally, but positive results were found in a separate study of Perry Preschool participants at 40 years of age.2 Only the financial returns for participants as they entered youth and adulthood were considered by the studies, not modifications in their parents’ behaviour. In the Abecedarian study, for example, all-day preschool made it possible for parents to work or upgrade their skills. Parental benefits from lowered welfare use and increased tax revenues paid were not factored into the results, nor were more immediate benefits accruing to the child, such as reduced demand for health care or special education. How replicable these studies are to a Canadian context is questionable. Canada does not have the same incarceration rates as the U.S., nor the same depth of racialized poverty—excluding Aboriginal populations—and it has the advantage of public health care, which plays a role in employability. As dramatic as the findings from these studies are, the initial outlay would be substantial and public investments that take a generation to realize provide little incentive for policy makers who often think in election cycles.